As world leaders meet this week in Paris to discuss global climate change, a new report from the University of Washington looks at expected climate impacts in the Puget Sound region. Christopher Dunagan wraps up his three-part series on the report’s findings with a focus on the region’s species and habitats. The current assortment of plant and animal species around Puget Sound is likely to be reshaped over time, as a result of rising temperatures, shifts in rainfall patterns and summer water shortages, according to leading Northwest climatologists. In the marine environment, species will be challenged by rising sea levels, higher sea surface temperatures and ongoing ocean acidification, they say. At the same time, some species — both local and invasive — could benefit from the altered conditions throughout the Puget Sound watershed. “There are going to be some winners and some losers,” said Correigh Greene, a research biologist with NOAA Fisheries. Salmon are likely to be counted among the losers, Greene said, while jellyfish and fish moving north from subtropical climates could be among the winners. The effects of changing habitats on Puget Sound species are outlined in a new report that pulls together the best information known about climate change’s regional impacts. The report, called “State of Knowledge: Climate Change in Puget Sound,” was produced by the Climate Impacts Group at the University of Washington. It was commissioned by the Puget Sound Institute with funding from the EPA, NOAA and the Washington Legislature. Some of the expected habitat changes are already being observed, scientists say, but the pace of change could accelerate into the future. The report describes how some species could eventually die out, unable to tolerate the ongoing climate shifts that rearrange the food web and alter the timing of biological processes. The following sections provide an overview of the report’s findings related to several habitat types, including marine, freshwater and upland forest environments. Ocean acidification, caused by absorption of carbon dioxide from the atmosphere, is already affecting the ability of some marine organisms to form healthy shells. Conditions are expected to grow worse, potentially reducing an important food supply for many marine species. As the food web is disrupted, species could be affected at all levels. Fish, birds and marine mammals could face a reduction in their traditional food supply. Globally, ocean acidification by the end of the century is expected to reduce the rate of shell formation in mussels, clams and oysters by 40 percent, with a 17 percent decline in their growth and a 34 percent decline in their survival. In addition, mussels will be less capable of maintaining a secure hold on rocks, because of changes to their extensible filaments, which they use to attach themselves. While ocean acidification could seriously impede shell growth, higher temperatures in a warming sea could actually encourage growth, somewhat offsetting that negative effect. Populations of fish that eat tiny, shelled organisms — such as English sole, arrowtooth flounder and yellowtail rockfish — could decline 10 to 18 percent along the West Coast if they are unable to switch to other prey species. Rising seas will change the composition of nearshore areas, the report says. As saltwater pushes in, salt marshes could more than double in size by the year 2100, assuming a sea level rise of 27 inches (about the middle of the projected range). Tide flats could expand by a similar amount. The total size of rare “transitional” marshes, where dry land is being converted to salt marsh, could become 70 times greater. 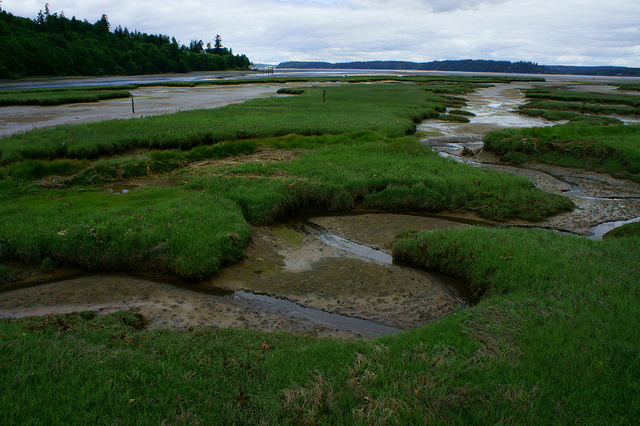 Tidal marsh at the Nisqually National Wildlife Refuge in Puget Sound. Photo courtesy of USFWS. Areas influenced by freshwater are expected to show declines. Estuarine beaches could decrease by 79 percent, brackish marshes by 57 percent, tidal swamps by 77 percent and tidal freshwater marshes by 24 percent. Changes would vary greatly depending on the territory, but increasingly muddy seafloors would tend to favor flatfish, such as sole and flounder, at the expense of estuarine areas that support salmon, Greene said. The state’s shoreline restoration efforts are beginning to account for future shoreline conditions under climate change, according to Jay Krienitz of the Washington Department of Fish and Wildlife. Krienitz heads the Estuary and Salmon Restoration Program, which provides funding for nearshore projects, including estuary and salt marsh restoration. Warmer temperatures and higher carbon dioxide levels could increase the growth of some critical habitats, such as eelgrass beds. Eelgrass provides food and shelter for an abundance of species, including herring, salmon and crab. As seawater moves inland, eelgrass beds can expand toward the shore — as long as undeveloped tidelands are available. If they cannot move shoreward because of development or lack of suitable substrate, eelgrass beds may decline as water becomes too deep for sunlight to reach. While warmer temperatures can help eelgrass, warm seawater is not so good for salmon, the report says. Declines of salmon harvests and fewer spawning adults have been reported during the warm phase of natural cycles, such as the Pacific decadal oscillation. Warmer ocean temperatures could cause salmon runs to decline, irrespective of conditions they could face in freshwater streams. Ocean acidification also could affect salmon by decreasing their growth rate as food becomes scarcer, thus subjecting them to increased predation. 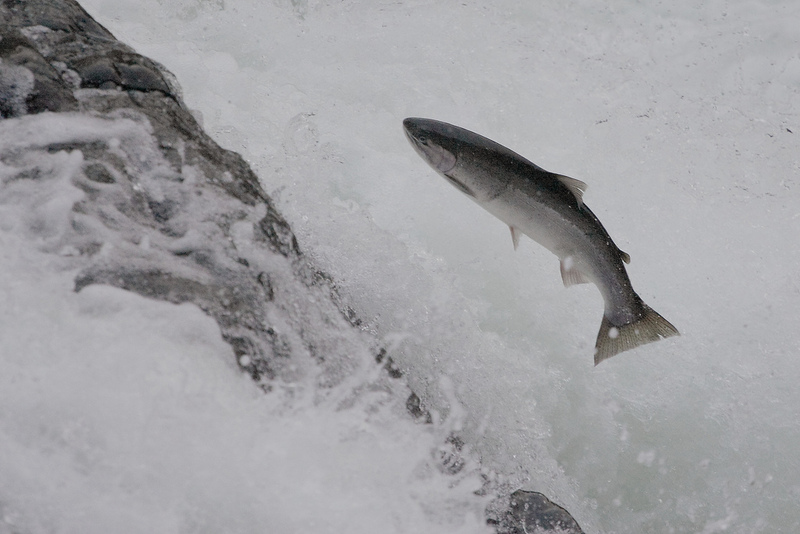 Greater acidity can further cause behavioral changes, such as reducing a salmon’s innate response to avoid predators. But it is warming freshwater along with changes in stream flows that may pose the greatest risks to salmon. Especially vulnerable are steelhead and coho, along with chinook that spend more time in freshwater, the report says. Populations with access to cold water tributaries upstream may fare better, while populations adapted to warm-water conditions may do best of all. By the 2080s, total streamflow in the Puget Sound basin is projected to increase by 40 to 49 percent during the winter months and decline by 32 to 40 percent during the summer months. Meanwhile, peak flows are projected to increase between 18 and 55 percent. Warmer stream temperatures — projected to rise by 4 to 4.5 degrees by the 2080s — along with reduced summer flows could delay salmon returning to their natal streams, as the fish wait for cooler water and higher flows. Such delays can increase competition for food, vulnerability to predators and the risk of disease. For juvenile salmon, warmer streams may have the effect of pushing them out into saltwater before they are ready to make the transition. Meanwhile, higher temperatures and altered streamflows also could encourage invasive warm-water fish to come into the system, altering predator-prey relationships and affecting salmon survival. Concerns extend beyond the effects of drought, as climate change will actually increase winter rains in lieu of snow. High winter streamflows have been known to wash out or crush salmon eggs as gravel moves downstream. Increased sediment loads can bury the eggs and reduce their oxygen supply. As shown in the Skagit River, egg mortality is largely driven by floods, with highest mortality occurring during the greatest floods. For juvenile salmon, high flows can wash them downstream out of more protected areas. “We need to slow the water down and keep it in the mountains a little longer,” said Dave Peterson, a research scientist with the U.S. Forest Service who has been studying climate change since 1988. Protecting and restoring floodplains, wetlands and complex stream channels will increase infiltration and maintain both surface flows and springs longer into the summer months, said Peterson, a contributor to the new report. 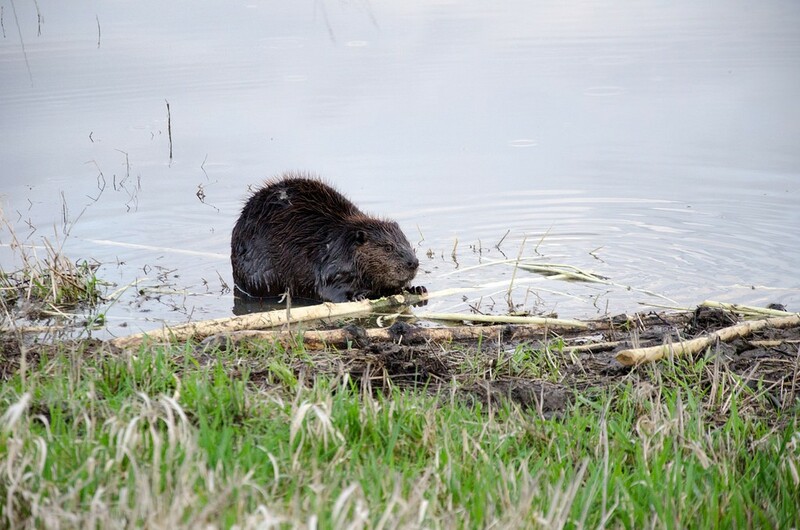 Encouraging beavers to build dams and even controlling man-made dams to increase summer flows could help counter the effects of climate change, he said. In lakes, increasing temperatures could alter the timing of critical biological events, such as shifting spring plankton blooms to an earlier period. If organisms that eat the plankton are unable to shift their timing, the result could be a serious gap in the food web. For example, phytoplankton growth in Lake Washington shifted 21 days earlier between 1962 and 1995. While some tiny organisms were able to shift their growth to match, water fleas — a key link in the food web — have not changed their growth pattern. The result has been an overall decline in this population, considered important to the health of Lake Washington. Freshwater wetlands are expected to decline in size with increases in air temperature, declining snowpack and lower summer precipitation. Wetlands near Puget Sound shorelines could be threatened by sea level rise. Wetland amphibians are believed to be highly sensitive to climate change, but more research is needed to understand how populations may shift. Factors that could reduce the numbers of these cold-blooded animals include warmer wetland temperatures, lower water levels or more frequent drying, along with changes in predator or prey abundance. Amphibians living in ephemeral wetlands are more at risk of disappearing than those in permanent wetlands. The geographic distribution of species is likely to change as a result of increasing temperatures, drier summers and other factors related to climate change. Some species may adapt to the changing conditions where they are; others may find suitable habitat elsewhere; and some species may simply vanish from areas where they were fairly common. Peterson said forests are likely to change more slowly than other habitats. Change may come intermittently, he said, driven by sudden disturbances such as wildfires. Increasing air temperatures and decreasing summer precipitation could reduce the habitat range of bird and mammal species in the Puget Sound region. The future of each species must be judged according to its needs. For example, as snowpack declines, wolverines and Canada lynx in the mountains of Western Washington are expected to shift to higher elevations. Wolverines require snow to build their dens, while both lynx and wolverines depend on snowshoe hares for their food supply, Peterson said. As snowpack declines, so go the hares and their predators, he added. With climate change, non-native species may be able to move into areas of Puget Sound that were too cold or too wet before. More research is needed to see how each invader might respond. Increased temperatures could result in increased tree growth at higher elevations, while declining snowpack will allow trees to become established in new areas where the growing season is longer. At the same time, trees in the lowlands that are less tolerant of summer drought may decline, expanding the rare lowland prairies. More research is needed to predict how certain exotic prairie species may fare in the Puget Sound region. Douglas fir, the dominant species in many areas, could suffer from hotter and drier summers, especially in South Puget Sound and on the east side of the Olympic Mountains. 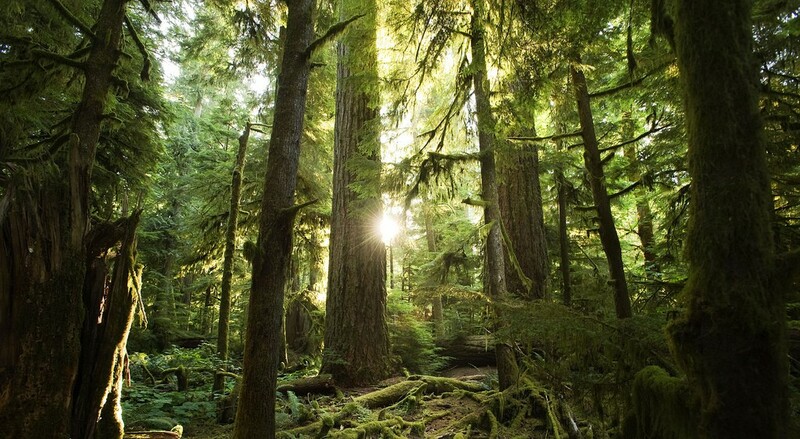 If they can avoid pest devastation, trees such as western hemlock, whitebark pine and western red cedar could expand their ranges, according to the report. Summer drought may slow tree growth, but less snow in the spring could lead to a longer growing season in the mountains. “The balance between increases in the growing season and decreased summer water availability will differ from place to place,” the report says. “North Cascade forests will experience a longer growing season but less water available to support ecosystems. Lower rainfalls are likely to decrease fuel moisture, leading to increased forest fires, the report says Two separate studies suggest that the average area burned each year in Western Washington could more than double by the end of the century. Insect and disease damage could increase as a result of climate stresses on trees, but lower summer moisture and increased temperatures could actually help some trees avoid problems. 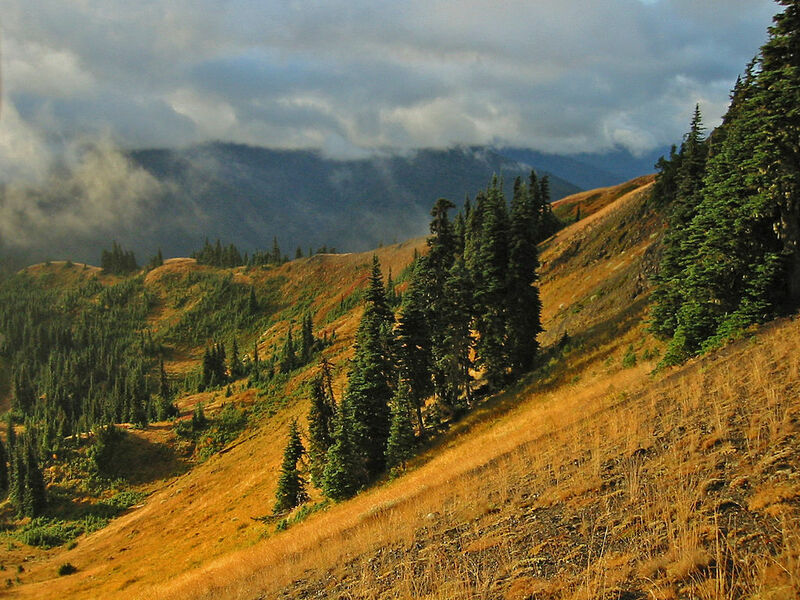 Bark beetles, for example, survive well in several areas in the Olympic and Cascade Mountains. 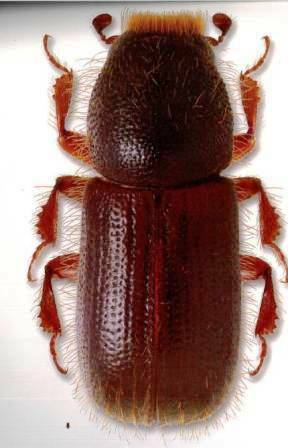 But with higher temperatures, the beetles may find suitable habitat only at higher elevations. To help maintain native species, federal, state and tribal agencies are developing various adaptation strategies. To help salmon, for example, strategies include restoring stream and floodplain complexity, protecting cold-water streams, rerouting roads away from stream channels and increasing forest cover to reduce snowmelt. To help wildlife, ideas include increasing the diversity of forests, purchasing conservation easements to maintain habitat connectivity, reducing built-up fuels in high-value areas and removing exotic species, including those that prey on native amphibians at risk of extinction.